NASA may have equipped its Mars Curiosity rover with an impressive array of scientific instruments, but the robot attach’s size and $2.5-billion price tag give its operators ample reason to steer clear of terrain that could jeopardize its mission. Which is a shame, because much of Mars’ craggy, cave-ridden, boulder-strewn landscape is so treacherous (planetary geologists literally call it chaos terrain), that big, expensive robots like Curiosity can’t risk accessing it. That’s why NASA’s Jet Propulsion Laboratory built Puffer. Short for Pop-Up Flat Folding Explorer Robot, Puffer is the agency’s latest origami-inspired device. JPL has experimented previously with collapsible solar panels based on the Japanese art of folding paper. Now its applying that craft to robots the size of a smartphone. Puffer cant match the scientific capabilities of rovers like Curiosity, or its successor, the Mars 2020 rover. But it can shapeshift, allowing it to scuttle up inclines too steep and through nooks too small for bigger robots. Thats critical to exploration of the Red Planet, where some of the most science-rich places might be the hardest ones to reach. Mars has caves, lava tubes, steep inclines, and overhung rocks, says JPL roboticist Jaakko Karras. Its very adverse terrain, stuff you wouldnt want to send your only multi-billion dollar rover into. Two years ago, that fact prompted Karras to start work on Puffer. The small robot stands just seven centimeters tall, weighs 5.3 ounces (a little less than a cue ball), and would cost millions—not billions—to build. Its two wheels bookend a circuit board chassis, the origami-inspired construction of which allows the wheels to collapse inward, bringing the entire Puffer into a flat configuration reminiscent of a horseshoe crab. Puffer is still in development. Future versions will wear a small camera and flashlight. JPL is also currently working with Distant Focus Corporation, an Illinois optics company, on a microscope. The size of a sugar cube, it can attach to Puffers underside and capture images of soil as it travels. The instruments on a Puffer cant rival the abilities of the rovers. But that’s okay—Puffer is, technically, an instrument itself. Karras envisions sending a rover and a small fleet of 10 or so Puffers on parent-child missions, where Puffers crawl into crevices and bring scoops of dirt back to the mothership. Puffer can live recklessly: Its folding joints not only allow it to nestle into small spaces, they also let it fall and land unharmed, like a cat. That’s something we hope to exploit, getting them off cliffs without having to drive around them, Karras says. In that light, Puffer is kind of like the GoPro of space exploration. 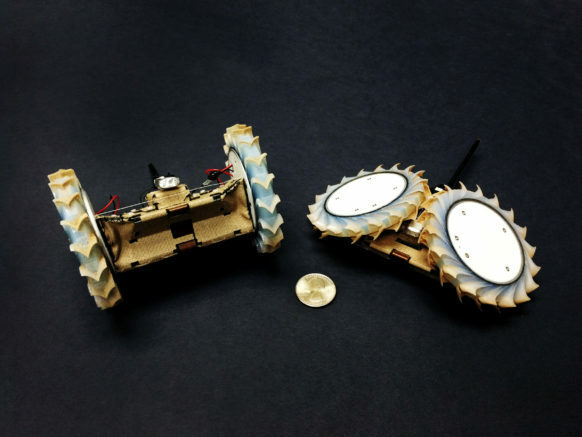 The robots design mirrors the shift towards miniaturization in the rest of the tech industry. The smaller gadgets get, the more places you can take them. As we start to push to more and more distant bodies, were going to be going in with less prior knowledge of the terrain,” Karras says. “Having something like Puffer gives you greater flexibility to adapt to what you encounter.